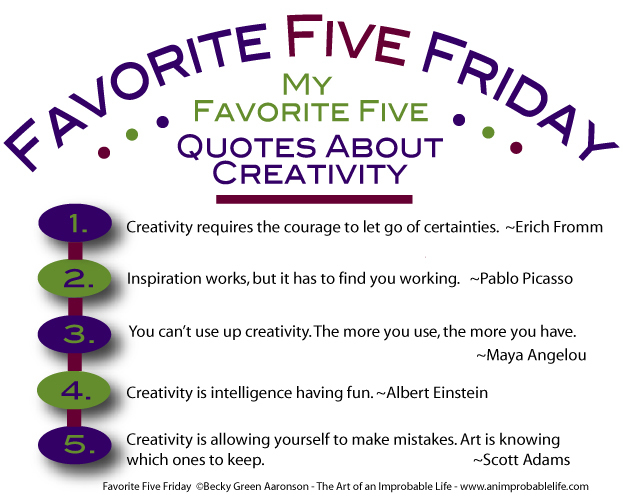 This entry was posted in Creativity, Favorite Five Friday and tagged Becky Green Aaronson, creativity, creativity quotes, Favorite Five, favorite five friday, inspiration, quotes, quotes about creativity by Becky Green Aaronson. Bookmark the permalink. I like your quotes and how you’re doing them by theme, Becky. What a great idea. Very creative, if you ask me. These are all good. I especially like #5. Thanks for the inspiration, my friend. Thanks Jayne. #5 is a good one to keep in mind during the editing process. I like both of those too!! ER definitely had it going on, and the chaos thing makes me celebrate the juggling act we perform daily while also trying to be centered, focused and creative. Thanks for sharing, and Happy Friday! Those are really great! Thanks for a creative way to start my day. Thanks, Cindy! Nice to hear from you. I hope your Friday is off to an extra creative start.